Three Weeks in Paradise is a superb PC remake of a classic Spectrum ZX action/adventure game of the same name from Mikro-Gen. Your goal as the bumbling hero Wally Week is to rescue several family members who have been caught by cannibals. To do this, you must collect various items and use them in appropriate places, in time-honored adventure game tradition. 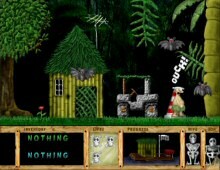 The game is a 2D adventure game similar to the Dizzy series. While it is not the first one starring Willy, it is the first in this series that features an inventory, so you won't have to do the annoying pick up / drop / pick up routine from those Dizzy games. The puzzles range from obvious to deviously difficult, and most of them are based on either horrible (and I mean that in the nicest sense) puns, or else a lot of lateral thinking – if you have played Infocom's Nord and Bert and Hitchhiker's Guide to the Galaxy, you'll have a good idea of what to expect in TWIP (although the puzzles are not as clever). There are also some arcade-ish portions where you must dodge dangerous things, but they are few and far between so as not to frustrate adventure gamers. Like Mikro-Gen's other classic Pyjamarama (which also has been remade into a very nice-looking PC version), much of the fun in TWIP is the (very British) humor that permeates the entire thing, especially in Wally's exclamations and mannerisms. The scrolling message line at the bottom of the screen that shows cryptic clues and cries for help from Wally's family is also a nice touch, and a good way of letting you know how much you have progressed and what you need to do next. All in all, a very nice remake that keeps intact the charm of the original game, while upgrading the graphics to the 21st century. Two thumbs up, especially for Dizzy fans.